This is for the lovely Deborah at ThisWeekIHaveMostly… who requested a couple of lip swatches before the weekend from my recent Hot Pinks post. Oh and just because this post is super short, I’ll take a moment to tell you about yesterday. If you follow me on twitter, you may have already heard this story… so move along, nothing to see here! So anyway, potty training. I haven’t actually started the process… I’m just testing the water and seeing how she reacts to the potty/having her nappy off/talking about it etc. Well, she crapped on the floor. I don’t know why I didn’t prepare myself for something like this but I should point out in my defence that I’ve never owned a pet that’s crapped on the floor either. I walked around the corner to see L pointing at this (impressive) turd, look of abject horror on her face while she explained to me breathlessly that she was just playing games when a coconut fell out of her bum. Laugh? Cry? I did a bit of both to be honest. Have a great weekend lovely people! 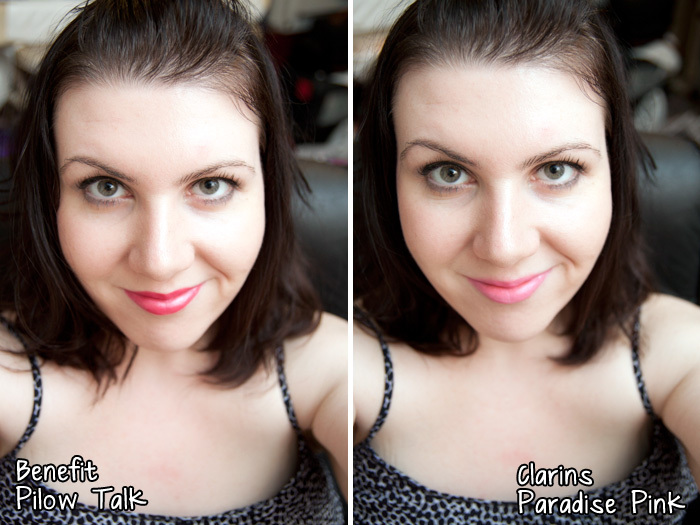 Firstly – loved the lip swatches. I feel like I need Paradise Pink. Secondly – a coconut!!!!!! I’m in stitches. A…a coconut…? That’s having kids in a nutshell, isn’t it? I really like Pillow Talk on you! Love the Benefit lippy, I think I may need to start trying their range. And a coconut just cracked me up! I’m glad I haven’t quite reached potty training age with my little boy just yet! My screen is too small. I want to see the photo of the five pink lipsticks next to the photos of you wearing the lipsticks so I can compare colours. Can you move them closer please? Thus cementing my desire to never have kids. Is Pillow Talk still available? I can’t seem to find it at the moment. I found it at Boots today, good thing I had those points saved up – it’s the perfect summer colour. I usually neglect my lips so I’m trying to get a couple of fun colours I won’t feel self-conscious about. I bought Benefit Pillow Talk immediately after seeing it on you!! Hope I do it justice!!! Pillow talk on you in just… splendid! You beautiful thing you.